Shai Agassi, the founder of Better Place, the most sophisticated electric-car enterprise in the world, projects the ebullient confidence of a man facing a giant wave of money. "Within less than this decade the No. 1selling car in the world will be the electric car," he says. "It's the biggest financial opportunity the world has ever seen. We're seeing a $10 trillion shift in an industry in less than a decade. It's the Internet, and add another zero." In the introduction to Start-Up Nation, Dan Senor and Saul Singer's best-selling paean to Israeli innovation, Agassi was the soft-spoken software wiz who had a brilliant idea and a terrible time locating a backer. That doesn't seem to be a problem anymore. "Not when you've digitized the most expensive molecule on the planet," he says. "We've digitized oil." He pauses. "I'll put it this way: We have people from China here." The People's Republic has been busy creating a bourgeoisie, and the middle class does like to drive. Beijing's next five-year plan foresees at least 170 million new vehicles, or perhaps twice that, according to Agassi. The lower estimate alone is as many cars as there are in Germany, France, Spain, Italy and Britain combined. The 8 million barrels of oil that would be required every day to fuel them is about as much as the U.S. imports every day. "Do you know what the price of oil will be in five years if they're not using electric cars?" Agassi asks. Enter Better Place, the start-up that makes more than electric cars. It also makes an entire infrastructure intended to free automobiles from the stubborn limits of battery life. When the enterprise launches in Israel later this year, drivers should be able to travel anywhere in the country in cars with a battery range of 100 miles (160 km). If they set off from Tel Aviv to the Red Sea, a journey of 200 miles (320 km), they will be able to pull into a Better Place station along the highway and exchange their low battery for a fully charged one. The process should take about five minutes. Otherwise, the car can recharge overnight via a plug that snaps into the little door above the rear wheel where gas would go if the car burned gas. 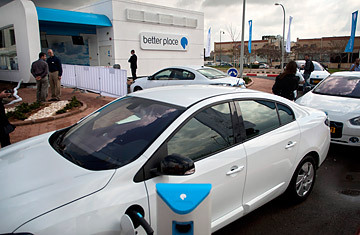 The vehicles can also trickle charge in parking lots where the company's distinctive blue-topped posts are located. Everything you need to know  the locations of switch stations and charging posts, the number of motorists already there, your own distance from each  is visible on a dashboard GPS screen. Employees have been testing the system for weeks, seeing, for instance, how much juice it takes to drive from Tel Aviv to Jerusalem with a car full of fat people, a carload of skinny people or just a car. By July, Better Place expects to begin taking individual orders for the Turkish-made Renault Fluence Z.E. (for Zero Emission), a four-door sedan that looks like any other car. Ordinary Israelis could be driving them as early as November. "It's going to depend on the price  of the car, and any charge for the battery, or charging the battery," says Dror Aikar, a Hyundai owner waiting for a tour of the Better Place showroom that 75,000 people have already passed through. Within sight of the beach north of Tel Aviv, it was built on the ruins of an oil-tank farm. Aikar wants to help the environment, he says. "But you can't do it if you don't have the money to do it." The pricing will be in two parts: First there's the car itself, which the consumer buys outright, except for the battery. That remains with Better Place, and comes with the "subscription," which is what Better Place calls access to the power infrastructure to run the car. The model is cell-phone coverage, with a variety of rate plans that vary with how much you drive. Rates for Israel are not yet final, but in Denmark, where the company is also setting up, the lowest rate is equivalent to about $300 a month for mileage of 6,200 miles (10,000 km); the highest rate  for unlimited miles  is about twice as much. The customers also pay a one-time fee equal to $2,000, but even so, in both Israel and Denmark where gas runs about $9 a gallon, Better Place calculates that the typical customers would stand to save 10% to 20% against a comparable gasoline car  and enjoy most of its satisfactions. "The car is very, very, very fun to drive," Agassi says. The electric sedan Agassi says will change the world, well, feels like a regular car. On the test track, the Renault four-door (a retrofitted Laguna, the Fluences are not yet on site) zooms smoothly down the straight, silent and more comfortable than, say, a Prius. The one similarity is that from a standing start there's a wee lag, more like the Prius than the G-force jackrabbit start of the Tesla, the torqued-up all-electric sports car with a base price of $108,000. "It's sub10 seconds zero to 60," says Agassi, of his ride. "If you want to go zero to 60 in five seconds you want the Tesla. If you've got another five seconds to spare, I can save you $80,000."